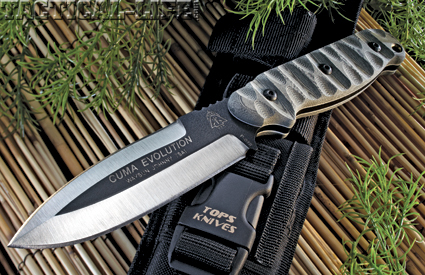 Johnny Tsai-designed TOPS Cuma Evolution knife sports two edges worth of CQ fight and utilitarian function! 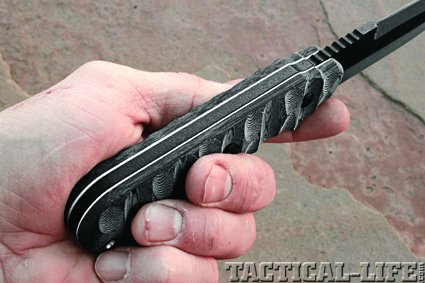 Founded on the experience of a team of veteran military and law enforcement operators and seasoned martial artists, TOPS has established itself as one of the premier sources of hard-use tactical fixed blades and folders. 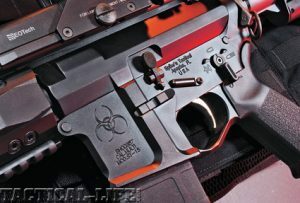 In the process, they’ve also forged strong relationships with a wide variety of military, law enforcement and personal-defense experts who have contributed designs to the TOPS product line. One of the latest TOPS collaborations is a fixed-blade combat knife that bridges the gap between the traditional Chinese martial arts and the modern battlefield. 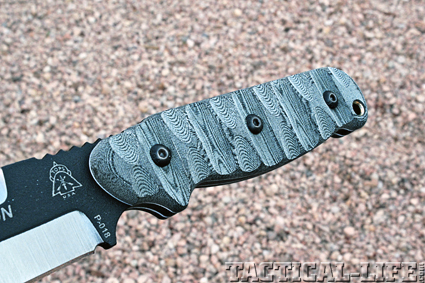 Officially known as the “CUMA Evolution,” it was designed by Waysun “Johnny” Tsai and directly reflects both his traditional roots and his understanding of modern combative needs. Johnny Tsai is a son of renowned Shaolin Kung Fu Grandmaster John Chi Yuan Tsai. Of Taiwanese and Puerto Rican descent, Tsai began training under his father at their family’s martial arts school in Chicago more than 30 years ago. At the age of 16, he earned his first-level black sash certification in his family system and the art of Tai Kit Kuen Kung Fu under Master Steven G. Abbate. Full-thickness, full-tang construction makes the Evolution very strong and shifts the balance toward the handle to promote user control. In addition to serving as chief instructor for three of his family’s schools, Tsai also traveled extensively with his father, teaching seminars around the world and working closely with some of the most accomplished martial artists of our time. Although he still preserves the traditional aspects of his art as the chief instructor of Tsai’s Family Chuan Fa Kung Fu System in North America, he has also adapted his skills to better meet the needs of modern self-defense. To that end, he is the “SiJo” (founder) of the modern systems of CUMA (Combined Universal Martial Applications) and the ARC reality-based fighting program (All Range Combat). These systems focus purely on practical combative applications, rather than the artistic aspects of the fighting arts. They also forsake classical weapons for more practical ones, like straightforward, functional combat knives. This focus was the inspiration for the CUMA Evolution.